Wahhabi says: Prophets are dead, not alive in their grave, they cannot hear you nor help you nor guide you nor aid you! Asking help from the grave of Prophets and Pious is an act of shirk! shirk! shirk! But Hadith says: Prophets are alive in their graves. 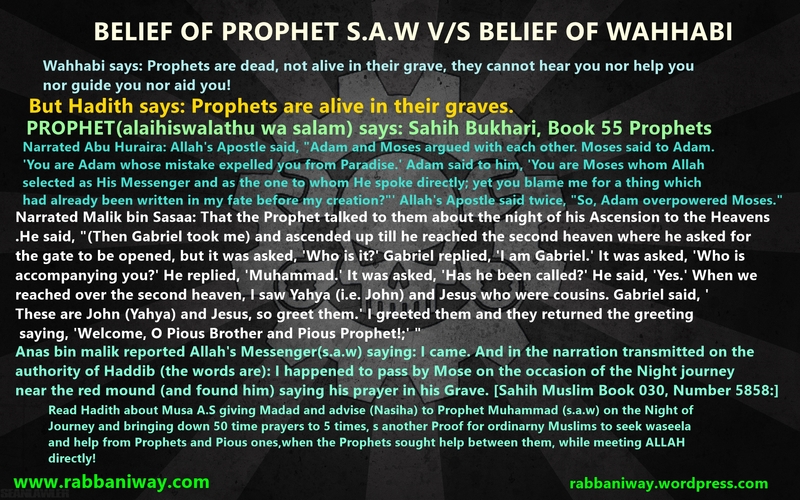 The above Hadith Proves that Prophets living a normal life in heavens after their death. They are hearing talking even making healthy arguments at times…. Masha ALLAH…hope to be with them in love and joy..ameen ya Allah. WHEN PEOPLE SEEKING HELP FROM PROPHETS AND PIOUS FROM THEIR GRAVE (SHRINE), WHEN THEY PRAY, THEY MAY MAKE DUA FOR US AND INTERCEDE FOR US. According to Shariah, the obligation of prayer and fasting of a believer end in this world, he as no opportunity to worship or fast after death! (to become a better Muslim), so it is evident from the above hadith that Prophets are not ordinary people like us! Sahih Bukhari Book 55 Prophets. “(Pious) Scholars are the inheritors of Prophets” -Hadith. So Wahhabi scholars do not have that, so they are not real scholars and they are not inheritors of Prophets! An authority to aid me from ALLAH’s Presence , not from our (eyes) presence! (narrated by al-Tirmidhi, 2606; classed as saheeh by al-Albaani). If the knowledge is book knowledge, then we must agree anyone study book knowledge of Islam are the heirs of Prophets! But we can see that Prophets were not learning from Books, they received spiritual knowledge from Revelations and Divine Inspirations. Vahyi (revelation) ended, But ILHAM (Divine Inspiration) continues, Awliya ALLAH who carry the secret and divine knowledge from Prophets. There will be 124,000 Wali of Allah who represent the secret of each Prophets. Salafi claim, anyone who study by heart the book knowledge is false! Quran says: 2:7 Allah has set a seal upon their hearts and upon their hearing, and over their vision is a veil. And for them is a great punishment. 2:10 In their hearts is disease, so Allah has increased their disease; and for them is a painful punishment because they [habitually] used to lie. 2:12 Unquestionably, it is they who are the corrupters, but they perceive [it] not. They do not perceive their own corruption and foolishness, then how can they understand those who are living in their grave? 2:13 And when it is said to them, “Believe as the people have believed,” they say, “Should we believe as the foolish have believed?” Unquestionably, it is they who are the foolish, but they know [it] not. 2:14 Those are the ones who have purchased error [in exchange] for guidance, so their transaction has brought no profit, nor were they guided. 2:15 Their example is that of one who kindled a fire, but when it illuminated what was around him, Allah took away their light and left them in darkness [so] they could not see. Quran 2:18 Deaf, dumb and blind – so they will not return [to the right path].